Singin’ in the Rain was a star vehicle movie musical for the unmatchable Gene Kelly as Don Lockwood, the Golden Globes Best Supporting Actor-winning Donald O’Connor as Cosmo Brown, and the Oscar Best Supporting Actress Jean Hagen as Lina Lamont. However, the glorious feeling comes when the rising star Debbie Reynolds gained critical success as young ingénue Kathy Selden. 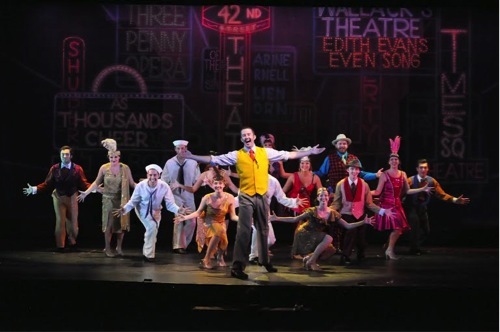 Reagle Music Theatre of Greater Boston mounts an astonishingly impressive stage production of the MGM classic movie with talented leading actors, strong supporting successes, energetic ensemble, and thrilling technical elements. However, 2013 My Theatre (Boston) Award NomineeGillian Mariner Gordon’s star turn as Kathy Selden rivals, and surpasses, Debbie Reynolds, making the production not to be missed as we see the making of Boston’s new lucky star. The stage production of Singin’ in the Rain mirrors the MGM movie, almost verbatim. The classic 1952 movie pays homage to the 1920’s Hollywood, when the black-and-white silent film actors loudly opposed the introduction of the new “talkies.” At the opening of the musical, leading man Don Lockwood (Sean Quinn) and leading lady Lina Lamont (Noreen Hughes) enjoy critical acclaim of their newest silent film. They are surprised when their next project is green-lighted as a “talkie.” The problem? We learn that Ms. Lamont is an egotistical monster with the voice that only a mother could pretend to love. A screen test and multiple takes of the same scene for the newest film prove comically horrendous, forcing the studio and its executives to seek a solution. Enter Kathy Selden (Gillian Mariner Gordon), a cute and young stage actress who tells Don exactly how she feels and feigns interest in his extensive movie credits. With the help of Don’s best friend, dancing smart-aleck Cosmo Brown (Edward Tolve), Don convinces Kathy to lend her superior speaking and singing voice to dub over Lina’s strained vocals. Of course, Lina can’t know this solution because she hates Kathy after a miss-thrown pie at a cast party, and complications arise, as Don and Cosmo keep Kathy hidden on the studio. The musical concludes with a classic climax and dénouement, where the hero wins the girl, the conniving gal gets what she deserves, and the victors dance off into the sunset. Of course, you can’t fault the material for its generic plot, especially when the journey is so much fun. Reagle Music Theatre assembles top-notch talent to match the iconic movie’s stars. Quinn is the classic charmer, the real deal with strong dancing to make you miss the glory days of male tap dancers, with an unabashed sense of pride in leading a dance. He is extremely successful in each of his dances with Tolve’s Cosmo, especially “Fit as a Fiddle” and the jaw-dropping “Moses Supposes.” Quinn also has the star-quality to manage the titular “Singin’ in the Rain” and the extended “Broadway Melody,” though the former lacks the vocal prowess to make the song soar in the large auditorium. Quinn is, first and foremost, a performer who tells a story with his feet; he achieves strong success as a charming leading man, especially with his onstage chemistry with Gordon’s Kathy. Quinn never manages to sell his songs’ melodies, however, and he seems to be in rehearsal mode with them. Perhaps Quinn channels too much of Gene Kelly’s uninspiring vocal style for this role. Tolve is a gem as Cosmo Brown. Tolve acts in every moment, squeezing nuance from his dancing, his glances, and his one-line zingers. His “Make ‘Em Laugh” almost brings down the house with its slapstick comedy and energetic dancing. Tolve never lacks purpose or energy, despite the extensive demands on the actor in this second-banana sidekick role. Tolve makes Cosmo the kind of best friend that you are proud to have stand next to you as your best man, that you want as a drinking buddy, and that you unashamedly want a bro-mance with in a vaudeville number. Hughes’ Lina Lamont is not someone with whom you want a romance, but Hughes brings much humor and credibility to the self-interested and imposing villainess. With legs for days, Hughes could easily just be a pretty face, but she is willing to give her Lina so many dislikeable qualities that the character becomes a humorously conflicting character. Her “What’s Wrong With Me?” is a star-turn of purposely screeching vocals juxtaposed with her gorgeous body and movements. But the star of the show is the young Gordon as Kathy Selden. Gordon is no stranger to the stage, but she feels like a whole new performer, a star reborn for this production. In her initial scene, she is a shy and restrained young actress on a park bench, but she quickly shows her conflicted personality, yearning for the man who always seems just beyond her status and dreams, and drawn to the film life that she has always shunned. Gordon emerges, like her character, as a triple-threat, combining superior line-delivery and character-development with the awe-inspiring vocals, especially in her subdued and emergent “You Are My Lucky Star” and the charming “Would You.” Gordon not only keeps step with Tolve and Quinn (despite their many additional years of performing), but she shines next to them, especially in the wonderfully delightful “Good Morning.” If you want to see three dancers who can show personality and story in their feet, watch their “Good Morning” to wake you up. Gordon has a bright future in the arts, performing into our hearts with graceful dancing, soaring vocals, and smart acting as Kathy Selden. The musical allows for some strong cameos from Reagle Music Theatre regulars, including Lina’s best friend Zelda Zanders (2013 My Theatre (Boston) Award WinnerMara Wilson), the Production Tenor (Christopher A. King), and Male Diction Coach (Daniel Forest Sullivan). Notably, the Girl in the Green Dress (Katelyn Prominski) is worth the price of admissions with her high kicks and seductive turns. The entire ensemble is one of Reagle’s strongest casts, a mixture of personalities and consistently strong dancing ability; the only problem is that many of the talented voices are lost in this show, which is a star vehicle rather than an ensemble show. This season had no true ensemble production to showcase the wealth of musical theatre talent in the Greater Boston area (unlike last season’s Fiddler on the Roof and Les Misérables). Hopefully, they develop a more diverse season for next year. Director and Co-Choreographer Kirby Ward seems to have found his groove with this musical, surpassing expectations with production values and technical skills. He makes it rain on-stage, and then he brings on the dancers to showcase them too. Co-Choreographer Eileen Grace brings her own expertise to the production, making effective use of impressive tricks and a succinct dancing ensemble. As always, 2013 My Theatre (Boston) Award Nominee David Wilson’s lighting design is a dynamic character to tie the production together, especially to highlight the beautiful colors in the studio’s scenes and the rising sun for the glorious “Good Morning.” Music Director Dan Rodriguez leads one of the best orchestras that I have heard in recent memory with a symphony of sound and a beautiful balance to support the singers. While the songs take a backseat to the dancing in this musical ride, Gordon’s soulful renditions soar over the orchestra’s subtle influence. Kirby Ward’s film sequences are especially impressive and laugh-worthy, a show-within-a-show treasure, and he keeps the many film and live-action scenes moving at an brisk pace, despite the musical’s lengthy score and book. Additional props to Technical Director Lori E. Baruch and Production Stage Manager Olivia Gemelli for executing the many scene changes with minimal interruption to the show’s fluid storytelling. 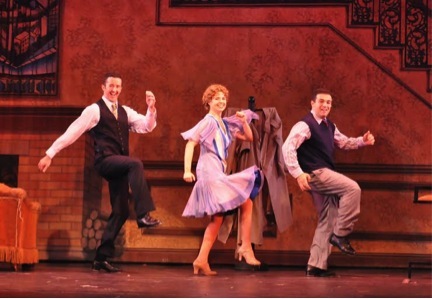 While Singin’ in the Rain’s source may date to over sixty years ago, Reagle Music Theatre of Greater Boston, with rising star Gillian Mariner Gordon and accomplished Sean Quinn, Edward Tolve, and Noreen Hughes, makes the show seem as timeless as ever. Journey back to simpler days and simpler times: to the joy of finding love and music in your feet, and to finding a song in your heart. They certainly had me singing and dancing with a pep in my step, waiting for the next puddle to splash in.